At Orange County Community College, areas of study under the Associate in Arts degree span a wide range of academic interests. Typically, these areas include specific studies in the social sciences, humanities, communication, education, the arts, and criminal justice. Students in this program should meet regularly with their advisors to determine the best course of study for their particular area of interest. 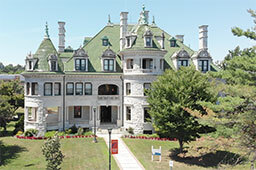 In addition to taking courses in their particular area of interest, students are required to successfully complete a number of General Education courses as mandated by the State University of New York. These General Education areas include: math, natural sciences, social sciences, American history, western civilization, world civilizations, humanities, the arts, foreign language and communication. Below is the suggested course sequence to complete the Liberal Arts: Humanities and Social Science degree. *Categories A-D must include: a SUNY History (GE 4, GE 5 or GE 6) and a SUNY Social Science (GE 3). **SUNY Humanities (GE 7) list or SUNY Foreign Language (GE 9) list-Elementary 2 level or above. *** MAT 102 or higher. Lab science not required. SUNY general education coure listings and courses that suit the Social Science degree requirement can be found in the College Catalog.